While McLaren still hasn’t announced anything to the public yet, multiple sources are confirming that their divorce from Formula One engine supplier Honda has been finalized. McLaren will run Renault engines next year, per Sky Sports, and plans to announce it during the Singapore Grand Prix race weekend. McLaren will take on a three-year engine supply deal with Renault to replace Honda, set to expire when new engine regulations come out in 2020, according to sources who Autosport claims are close to the deal. It is understood that McLaren will get the same engine specification as Renault’s works team and Red Bull. Likewise, Toro Rosso has reportedly signed the deal to take on Honda power units in McLaren’s place, per Autosport’s sources. The move comes for obvious reasons, as Sky Sports notes: unreliable and off-pace Honda power produced three painful-to-watch seasons for McLaren without so much as a single podium finish. McLaren has been deeply unsatisfied with Honda’s performance, as they’ve gone from competing for world championships to trying not to finish dead last. The Renault deal is all done. Alonso staying is super news. But I can’t see why McLaren will be any happier with Renault than they are with Honda. It wasn’t Honda’s fault things didn’t work out, it was McLaren’s. Every day they had a fight about everything, instead of working with them, which was a little bit stupid. Then again, wouldn’t you fight with someone who’s not delivering what they promised, too? We’ll see if Toro Rosso does any better with Honda. Of course, it’s the rest of the details around the Honda-Renault swap that have yet to be finalized. Reports have said that promising Toro Rosso driver Carlos Sainz Jr. would be loaned out from Red Bull’s driver program to Renault’s factory team in exchange for Renault letting Toro Rosso out of their contract early. The big question is when Sainz would make the move, and now both Sky Sports and Autosport report that Sainz should be staying at Toro Rosso through the end of the season to bolster Toro Rosso’s championship points. Sainz is reported to be replacing Jolyon Palmer at Renault, as Palmer hasn’t scored a single point for Renault all year. Palmer also expects to see the rest of his contract out with Renault through the end of the year, reports Sky Sports. By making this switch to Honda power, Toro Rosso—which acts as a de facto junior squad for Red Bull’s main F1 team—could feel out whether Honda ever develops a competitive power unit for Red Bull years on down the line. Red Bull still aren’t happy with their Renault power units, as they’ve only been more reliable than Honda’s dumpster fire of a power unit. Their relationship with Renault got so bad that Red Bull rebranded their power units as “Tag Heuers” after being unable to secure a better engine deal elsewhere. 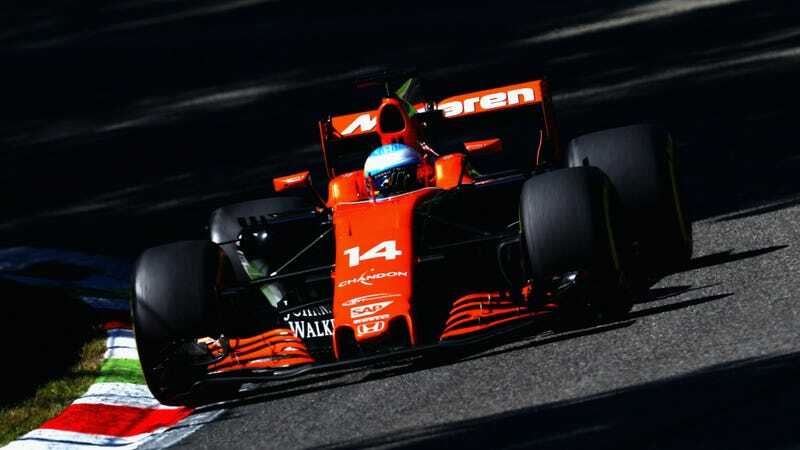 Back at McLaren, no further announcement has been made about extending star driver Fernando Alonso’s contract. However, Sky Sports’ report still notes that sources close to the team believe a switch to the marginally better Renault engines is enough to convince Alonso to stay for 2018.